I guess one of the benefits of the new job I have is that because I often have to do early morning calls my commute into London is a little later than in my previous role. That’s a benefit from a blog perspective because it means I’m writing today’s instalment having just seen the team news released through the club’s official twitter feed this morning. The news is welcome. We have Özil, Aubameyang and Sokratis all fit, the latter of which was probably the biggest surprise and means that we have an extra defender to call on a little earlier than expected. Sokratis has been our best defender this season and his absence from the United game has been a miss. I like many of you was pretty underwhelmed by his signing but the fact that he’s back a week or two before he was expected is a good sign. It’s also good because every week you spend injured and therefore not training, means an extra day or two to get back up to speed with the pace of first team football. So the fact that Sokratis has only been out for a couple of weeks is good because it means he’ll be able to come back and get back up to speed. Whether or not he plays tomorrow remains to be seen and I’m interested in how Unai approaches tomorrow’s game. My gut feel is that he will absolutely go for the strongest possible team in his eyes and so we’ll see players like Koscielny, Sokratis, Kolasinac, Xhaka, Auba, Laca, etc. This is especially the case given there is a whole week off from football after tomorrow’s game. So the players can be well rested ahead of the next few weeks which will see us play three games in seven days from ext Thursday. Thankfully they’re all at home and that means that there isn’t much travel to impact the team and rotation might be a bit easier for the manager, but he’ll want to make it even easier by beating BATE well tomorrow, so it leaves the door open for rotation in just over a week’s time. Unai’s short time at Arsenal has already shown us he likes to go very strong early on and he did that for the opening games of the Europa group stages so I’m hoping that he takes a similar approach tomorrow. Then we can give games to the likes of Jenkinson, Elneny, Willock, Nketiah, etc, next week if the job is done and done well enough. 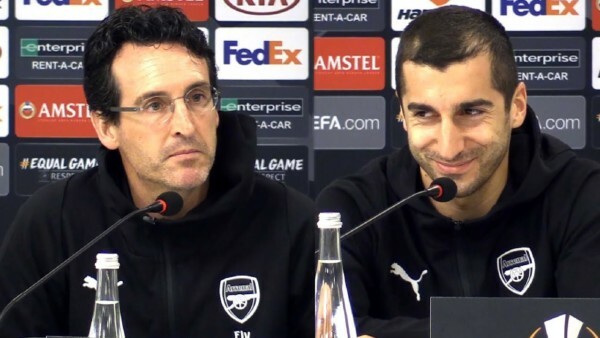 Unai will no doubt give us an insight in to his thinking in the presser a little later today but for now at least it looks like we have some positivity in terms of injuries to be happy about. And that’s probably all we should focus on today. Let’s not bother with any kind of negativity because it feels like there’s plenty of that going around as it is. Let’s just look forward to a Europa League game that could get us one step closer to a trophy. Catch you lovely humans tomorrow. Disagree with your comments on Sokratis who to me is a very average player.Prior to his injury, Holding was without doubt our best defender.